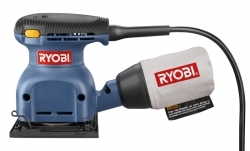 I bought my Ryobi palm sander (S651DK) from Home Depot. The sander works as well as I expected. I've used many brands over the years and don't really have a favorite. The dust bag is almost pointless. A piece of tape over the hole would do as well. The bag doesn't catch much, but without the bag it kicks up more dust because of the air that blows out the hole. I don't like the push-through on/off switch. A button on each side of the grip pushes in and out to turn it off. A switch in one place is fine with me. Pad Size: 4.25" x 4.5"